Today we have a guest review from blogger and author Margay Leah Justice. The novel, Persuade Me, is an adaptation of Jane Austen's Persuasion and sounds quite excellent. Welcome, Margay! I consider myself a romantic at heart. I like to watch romantic comedies, I get sappy at Happily Ever Afters, and I re-read tried and true romances to remind myself that they do exist – if only in the pages of beloved books. So it’s no surprise that I have a special affinity for Jane Austen. I love her stories, her affinity for recording the foibles of humans who dance the dance of love – and the idiosyncrasies of all the secondary players who make the heroes and heroines what they are. My one problem with Miss Austen is that she didn’t write enough stories! I feel like her main six are just a teaser – but oh, what a tease! So, to fill in the empty spaces left behind by what could have been had she written more, I like to read adaptations of her stories. In my quest to get more of Jane Austen and the wonderful characters and worlds she created, I read just about every adaptation I can get my hands on. Some have been good, some not so much. But there’s a rare few that take my breath away and make me want to read them again. One of those stories is Persuade Me by Juliet Archer. 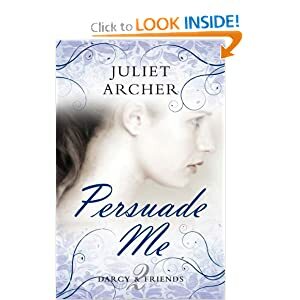 Persuade Me is a modern retelling of Persuasion and it has just enough quirks to make it original. The main characters, Anna and Rick, met and fell in love in France, but she, on the advice of an old family friend, broke it off, convinced it was a poor match, and then was whisked back to England by a father who can hardly bear the sight of her. Flash forward some years later and Anna has developed into a self-assured woman with a degree in Russian Literature and Rick is a marine biologist living in Australian who is making a splash in the world of literature having written a book with a somewhat provocative title. During his book tour – which inevitably leads him back to England – Rick crosses paths with Anna once again and the adventure begins. I have to admit that Persuasion is one of my favorite Austen stories, so I was excited to read an adaptation of it. I don’t think it receives the attention Pride and Prejudice does, but it deserves it. This is such a classic story of lost love and second chances, ripe with likable characters and despicable ones and it translates well to modern times. In Ms. Archer’s hands, the story shines, taking on its own relevance and leading the reader by the hand through the story to the inevitable conclusion in such a way that, if one hadn’t read – or was even aware of – the original piece, it wouldn’t matter. They would still be enthralled by this story. Indeed after reading it, one might be encouraged to read the original to see how it compares. I must admit that, sometimes, I’m hesitant to read adaptations because I’m afraid they won’t measure up to the original, but Persuade Me does not disappoint. It hits all the key points – the love story between Anna and Rick, the influence of the family friend, the despicable natures of Anna’s father and older sister, and the clingy, whiney nature of her younger sister – in the original, but does it in a way that makes it seem fresh. The idea of Rick being a biologist and writer rather than a captain is a stroke of genius. Anna being more self-reliant and not so much under the thumb of her family is a welcome relief. The book tour is a brilliant way to get all of the other key elements together and make it the author’s own. I had so much fun reading this book, I can’t wait to read it again. But first, I want to check out the first book in the Darcy and Friends series, The Importance of Being Emma. Final verdict: Extremely enjoyable and I would recommend it to any Austen fan and anyone who just loves a darn good story. The words ‘forgive and forget’ are not in Rick Wentworth’s vocabulary. The word ‘regret’ is definitely in Anna Elliot’s. When they meet again ten years later, he seems indifferent and intent on finding happiness elsewhere. Can she convince him that their lost love is worth a second chance? Persuade Me, JA’s modern version of Persuasion, will be available in September 2011. In the meantime, you can read the prologue and first chapter here or feast your eyes on a certain Captain Wentworth. JA says: Just as I felt Knightley needed updating for a 21st-century audience in The Importance of Being Emma, I’ve given Anne Elliot similar treatment in Persuade Me. My Anna leads her own life and is financially independent of her father, although there’s enough baggage between them to fill an airport carousel! I’d love to know what you think of the extract - email me at juliet@julietarcher.com. Thank you, Margay! That sounds like a great book. Margay Leah Justice is the author of Sloane Wolf, available at museituppublishing.com. You can also find her on FaceBook, Moonlight, Lace and Mayhem, Twitter, MySpace, and the Jane Austen Society Pages.